(CNN) – GOP vice-presidential candidate Paul Ryan said Sunday he's not counting on gaffes from Vice President Joe Biden when they debate on October 11. "I don't think he will. You know he doesn't do that in debates. The gaffes - he's kind of legendary for this - that's not in these kind of situations," Ryan said on "Fox News Sunday." "He's a very disciplined person when he speaks in these kinds of situations. He doesn't produce gaffes in these moments. Those are when he's off the cuff." As for his own debate preparation, Ryan said he's not worrying about coming up with creative lines - he's just going to be himself. "I'm not really a line guy. 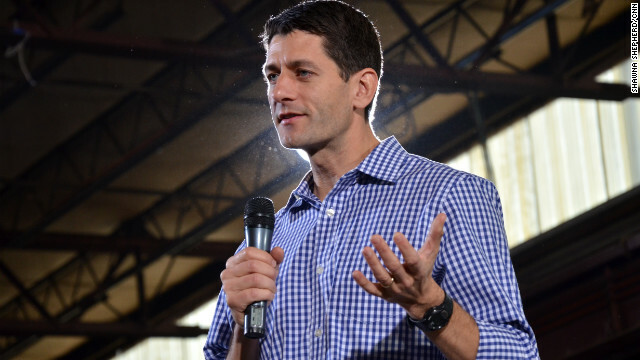 I'm more of a gut guy," Ryan said. "I believe in what I believe. I do what I do. And I really believe in the policies we're providing, that we're pursuing. And at the end of the day, I'm just going to go in there and be me." Ryan has been preparing with former Solicitor General Ted Olson, who is playing the part of Biden in mock debates. Ryan said Biden has excellent debate skills, so his plan is not to try to rattle Biden, but to simply lay out the Romney-Ryan vision for America. "What I hope to achieve is to give people an alternative - a very different governing philosophy, different policies. And Joe is very good on the attack. Joe is very good at trying to confuse the issues so that the person leaves the debate confused about who stands for what. My job is to make sure that they're not confused about what we stand for and what they stand for," said Ryan. The vice-presidential debate will be held at Centre College in Danville, Kentucky. I will take a gaffe from Vice President Biden any day over Ryan. At least we know where Biden's heart is. When it comes to Ryan, all you heard from him are lies. Can't wait to watch Biden bury this guy. I hope he does such a good job that we will laugh about it for years. He thinks he knows what the American people want but like Romney they don't have a clue, they just want to mess with our medicare and social security , just because their future is set as career politicians. I think Joe Biden needs to simply ignore Paul Ryan. It is the same thing I hope President Obama will do. If they simply don't respond to them, let them try and throw their zingers, if both the VP and the President simply focus on honest answers, and specifics and talk to the American people they will both wipe up the floor with both challengers and the two narcissists won't know what to do because the attention will not be focused on them, and they will look small and petty as they continue to spew negativity and no plan. But we can expect lies from stench junior for sure!